Too tired and hungry to write a full report. Finished work later than hoped, but Richard and I still made it to the dock by 6pm. 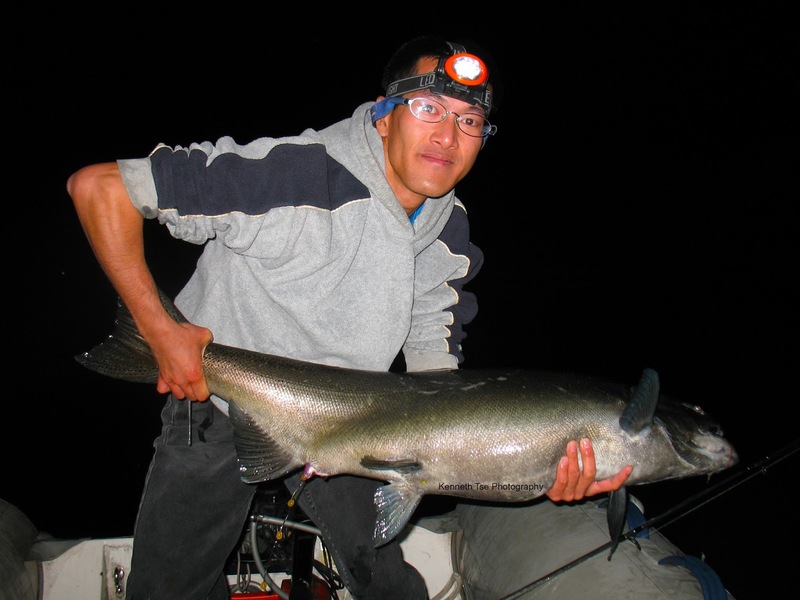 Casting for pike was fruitless...so once dusk approached, we switched to glow spoons. 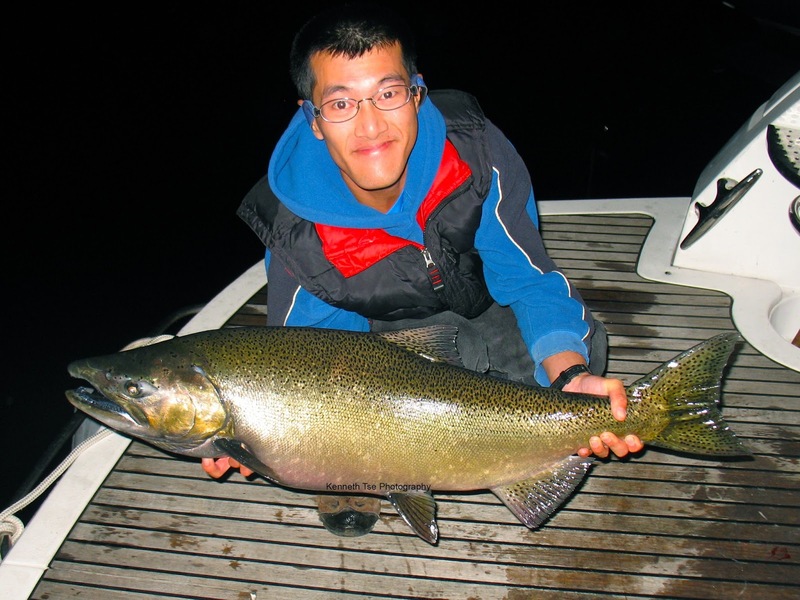 At around 7:45, Richard hooked into the first of the night...a 20lb male salmon. Then it was a bit quiet, so Richard prepared the dinghy for launch. While he was busy with the dinghy, I made a few cast and got hit but fish missed the hook. Once launched, we fished on anchor in 15 feet of water and cast in 360 degrees. I cast toward shore and was picked up at around 8:30. She was a big girl! About 15 minutes later Richard got hit and he landed another male around 20lbs. It was a bit quiet after. I got ripped hard around 9:30, but the hooks did not set. I got hit again around 10:15. This time the hook stuck and it was another male. This one broke through Richard's net yet again...and unfortunately, my rod tip was trapped in the mesh when the salmon fell through...and that horrible, horrible SNAP! Fish took a casualty...and it was my new favourite rod too! Even so, we landed it with my net. I should have filleted his arse! We stayed until 11pm but nothing exciting transpired...so we called it a night. Not bad for 5 hours of after work fishing...now I'm going to stuff my face with pizza LOL. 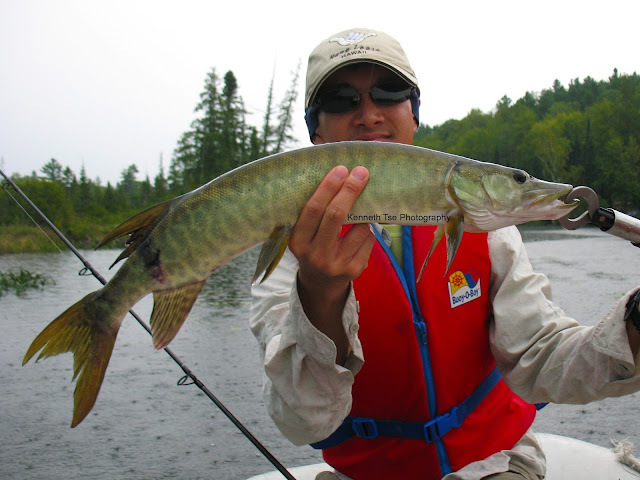 Muskellunge (Esox masquinongy), commonly called "muskie" or "musky", come from the Ojibwa word maashkinoozhe ("ugly pike"). Personally, I find them as the fairer cousin of the Northern Pike. 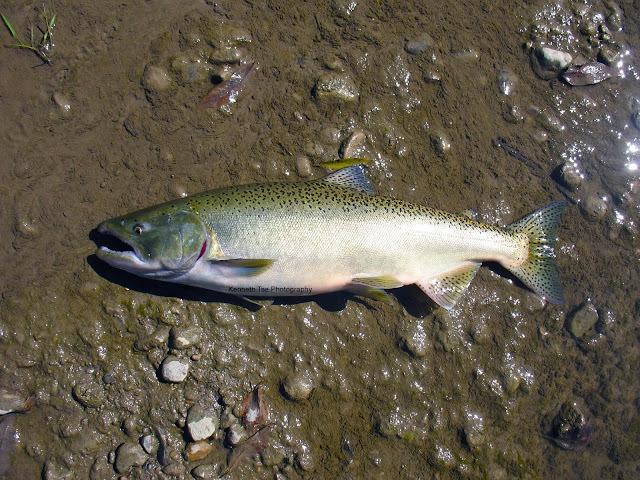 The mystique surrounding these often difficult to target fish also elevate them into a class of their own. 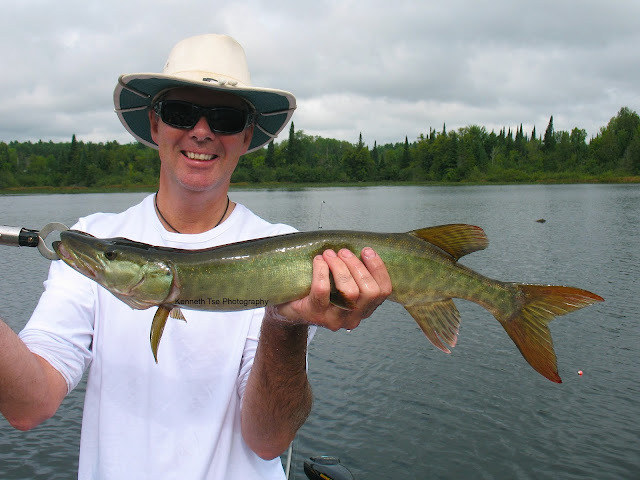 A trophy muskie is truly a highly regarded prize. Coming out of fishing hiatus just for a special lifer trip, I had the pleasure to take Richard and his son Tristan on their quest to catch a lifer muskie this weekend. 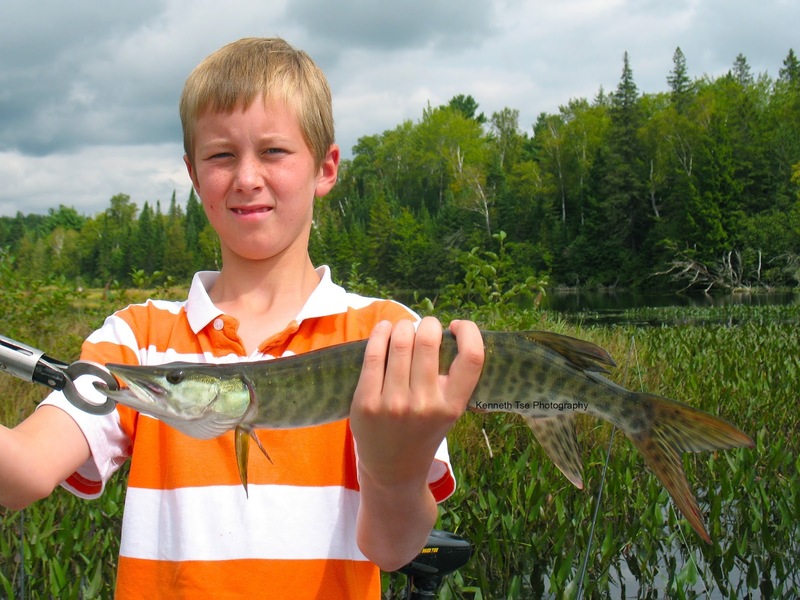 Our location is a muskie factory with a great population of smaller individuals - the average size here is in the high 20-inch to low 30-inch, with the occasional 40-inch plus. We only had 1.5 days to find them, so instead of fishing some trophy waters, I wanted to have quantity in our favour. Friday afternoon, we arrived to set up camp first. Rain was in forecast so securing a dry refuge was crucial. By 3:30pm, we finally launched the little dinghy into the tannin waters of (not-for-your-eyes) and started plugging the shorelines. After an hour of fishing, the usual muskie haunts were pretty vacant, so we fished toward Rocket Bay to see if one of these little rockets could be found. 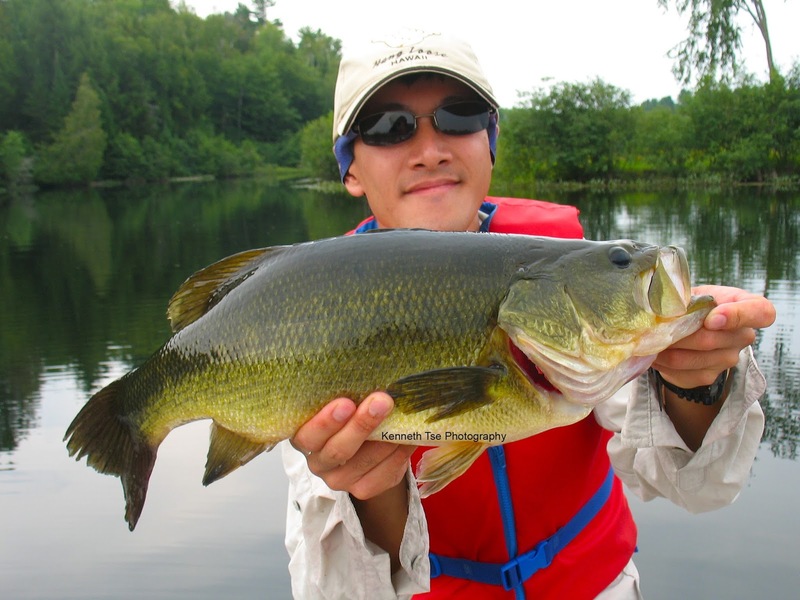 Along the way, Richard caught a 1lb Largemouth Bass with a frog patten Jitterbug. The mouth of Rocket Bay was enclosed by a point topped by healthy green weeds and patches of lily. I have caught some nice bass off this point in the past. Casts were made to deliver the muskie bucktail inches from the shoreline vegetation and pull them out of the shallows over weedline. 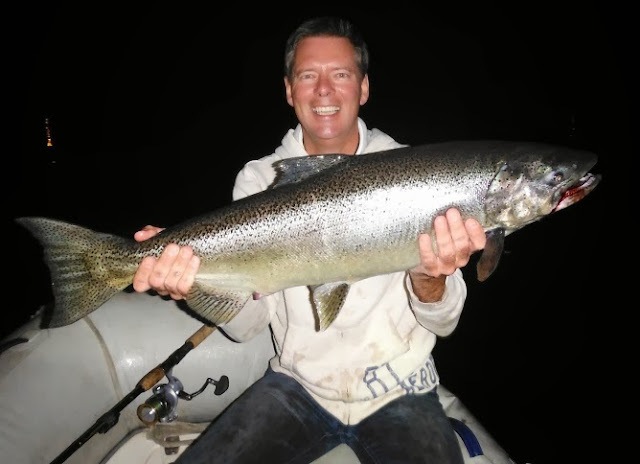 One cast produced a THUMP as soon as the lure landed, follwoed by deep headshakes and an impressive jump, and an incidental catch was brought into the net. We didn't tape measure or weight this fish, but I would guess it was around the high 3 to low 4 range, making it a potential personal best Largemouth Bass. A great catch, BUT it wasn't a muskie! Once inside Rocket Bay, we started the drift down one side along the weedline. If we positioned the boat on the line, it was possible to cast into the shallower weedbed and the deeper basin at the same time. Casting ahead and behind the boat would allow the angler to work lures parallel along the weed edge. Boat position was critical fishing here, but the wind was making our job difficult. After covering the entire length of the bay, the wind hastened and the drizzling rain became a steady shower. Rain or shine, the decision was to continue fishing with our limited time. We drifted deeper into the back end of the bay where it was usually too shallow for bigger muskies, but it was here where my lure was stopped during the retrieve. Initially guesses of another bass turned into a happy revelation when a long body came to the surface. Just a little 26-inch muskie, but target nonetheless. Poor little guy was bit by a slightly larger muskie. 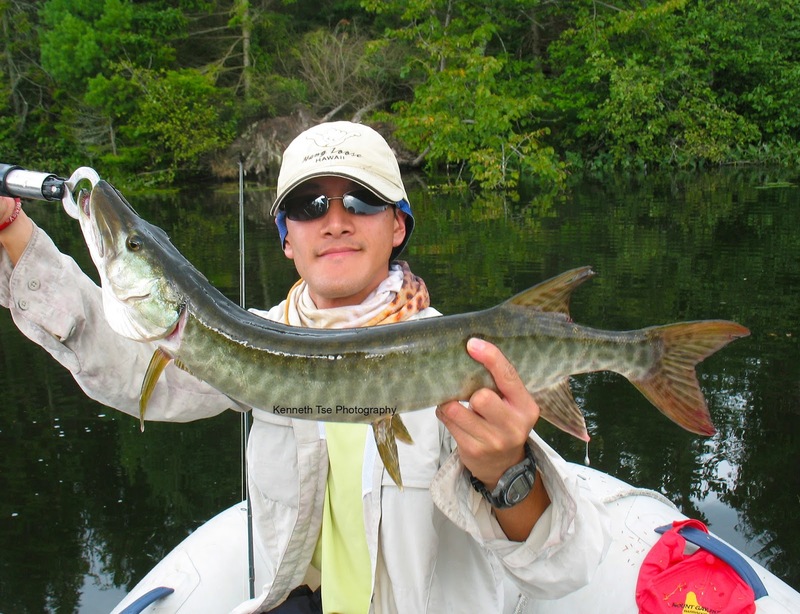 After seeing the muskie, Richard switched on the hunting mode. He swapped his Jitterbug for a black buzzbait. As we turned out of the back bay to work down the other side of the bay, his buzzbait was stopped by a small muskie. Unfortunately, due to some issues, his first muskie experience turned sour when the fish jumped off. The rain was coming down pretty hard now but we fished on. Tristan was a trooper donning his rain jacket and manning the live bait line. We saw a giant floating yellow banana and Michael finally arrived to join us. The four of us plugged the shoreline pretty well but failed to garner another hit. The intensity of rain increased exponentially by the second and now it was torrential and horizontal. The wind was constantly pushing the boat toward shore, so Richard and I decided to call it a day for Tristan's sake. Michael decided to wait out the storm. As expected, when we finally got back to the launch and hauled out the dinghy, the rain stopped. It was a bit late to launch again, so we simply returned to camp. Later, we found out Michael was reward with a 30-inch muskie after dark on a buzzbait. Everything was drenched and even the tent seams had small leaks, but we did start a campfire, had dinner and roasted some marshmallows. 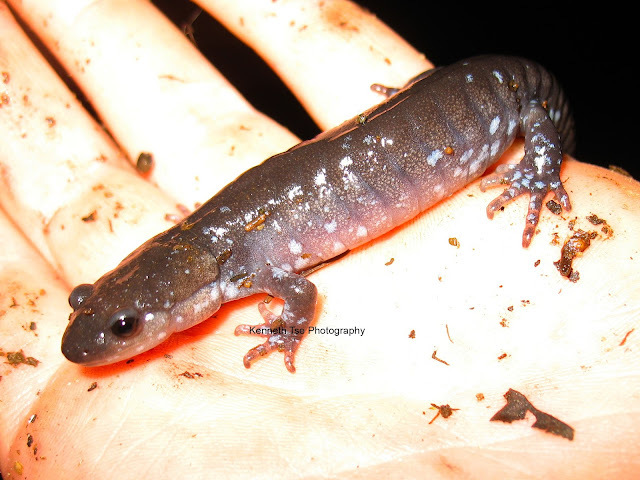 Since the ground was so damp, the amphibians were crawling about, including this beautiful Blue-spotted Salamander (Ambystoma laterale). We had a late start to the morning knowing Tristan would appreciate a few more hours of sleep. After breaking down camp and having breakfast, we were finally on the water by 9am. We covered some of the usual muskie haunts again but found nothing aside from a couple of Largemouth Bass, so onwards toward Rocket Bay we went. Michael was already there but reported a very slow morning. We made a drift down the left side of the bay with no love. 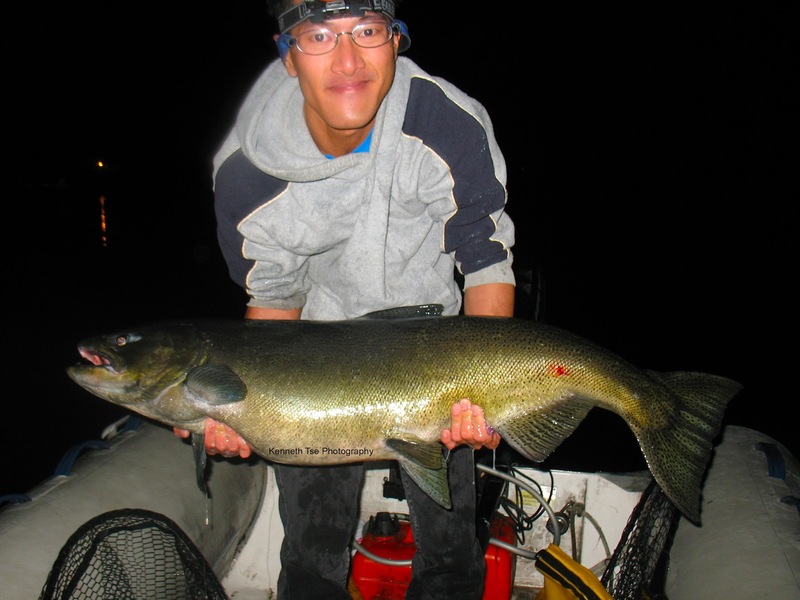 While drifting down right side of the bay, Richard finally hooked up with the right kind using a firetiger Husky Jerk. Another 26-inch muskie, but a lifer nonetheless! We made a drift down the left side of the bay again and I hooked up near the mouth of the bay. It was an even smaller 23-inch model, but so very beautiful. Fishing was pretty slow in the bay and we decided to explore new territories. We found one nice looking shallow bay and I had a small muskie followed the bucktail. Fishing back in the main deeper areas again, we drifted down the shorelines until we hit a little shallow saddle area. My initial cast was fouled with some green weeds, but the follow up cast was grabbed by a little one. By this time, it was already 2:20pm and Tristan had all but given up on the live bait rig. He had been extremely patient with the two fish heads in the boat but obviously showing a bit of frustration for his lack of excitement. I handed the rod off to him so he can land his first muskie as well. Exploring more areas, we found this turn in the shoreline where there were three downed trees within 30 feet area and a floating dock 15 feet to the right. In total, we tempted 4 muskies from this spot, but all of them showed varing levels of interest without a solid hookup. Michael was the closest after the same muskie hit his Figure-8 three times but failed to hook up on each hit! I saw the biggest fish of the trip which was a 30-inch plus muskie following the bucktail, but the fish dropped off the chase upon seeing the boat. Frustrating...but that's typical of muskie fishing. We finally found the bay where Michael caught his lifer Tiger Muskie and regular Muskie. This spot produced only a hit for me today. We continued to push on deeper into the unknown until we reached another promising shallow weed shelf. A couple of casts later, I was rewarded with the 3rd muskie of the day at 4pm. We fished another hour in the area and decided to troll back to the launch for no further love. It was a decent day of muskie fishing. In the past few years, I typically experienced more follows from bigger fish and less fish landed. 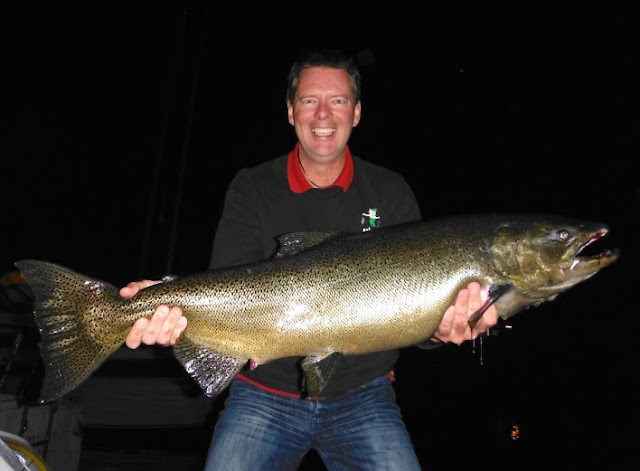 This year, we landed a few smaller fish but didn't see anything over the 30-inch range. Perhaps it was the time of year, or perhaps it was the low pressure that blew through the overnight. I know there are bigger fish in the area...so maybe Thanksgiving weekend will allow us another try at it. Regardless, we had a fun weekend of muskie fishing and I was glad Richard landed his first ever muskie and Tristan got to hold one of his own as well.